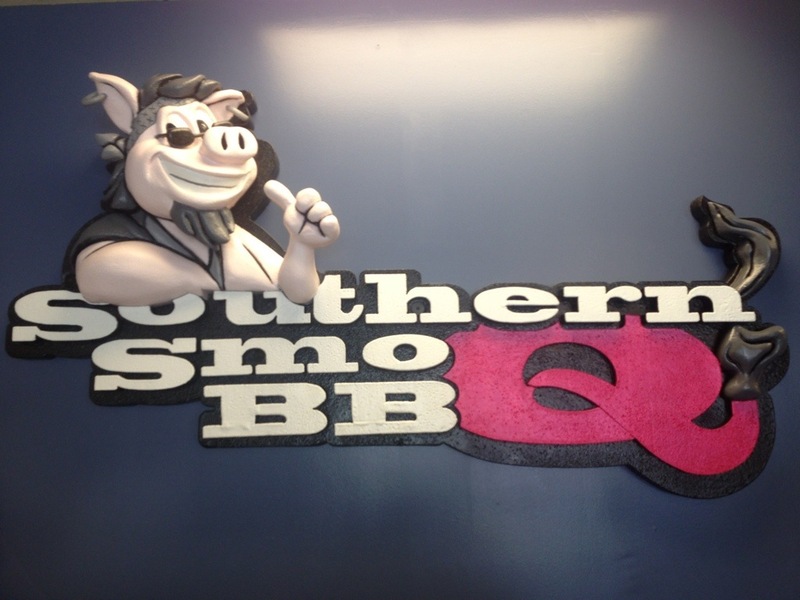 I’d like to start this entry with a tip of the hat to Marie, Let’s Eat for pointing me toward Southern Smoq Bar-B-Q. When I got the email signalling the blog entry about their visit, I was excited to find a new place (relatively) near my office that was getting good reviews. I have a contract fellow that comes in every couple of weeks for a couple of days and marked this spot down as one for us to try. Today, with the window between conference calls wide enough to accommodate a 20+ minute drive in each direction, we hit the road for Flowery Branch. I think calling where they are Flowery Branch is generous, as it felt like we were driving to Braselton. Located in a Kroger shopping center, the giant Q in their logo pulled us to the right spot. When we arrived, a little after noon, I was surprised that there were only two other folks there – one seated waiting on food and the other waiting for carryout (you can see how empty it was in the photo above). The young man behind the counter was eager to help and when we answered negatively to “Have you been here before?”, he rounded the register and walked us through the menu. You have to admire a place that has a menu of sauces. At least I do. 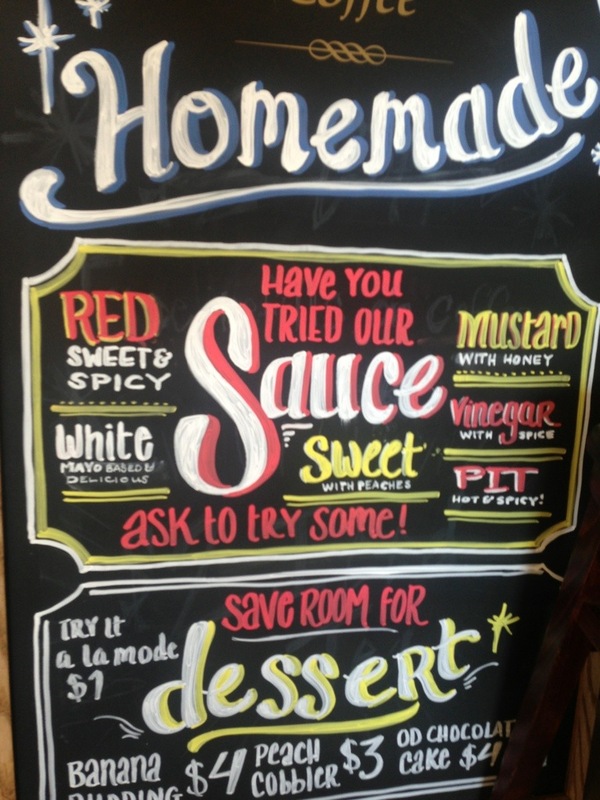 The list got my attention, particularly the mayonnaise sauce that I associate with North Alabama barbecue. 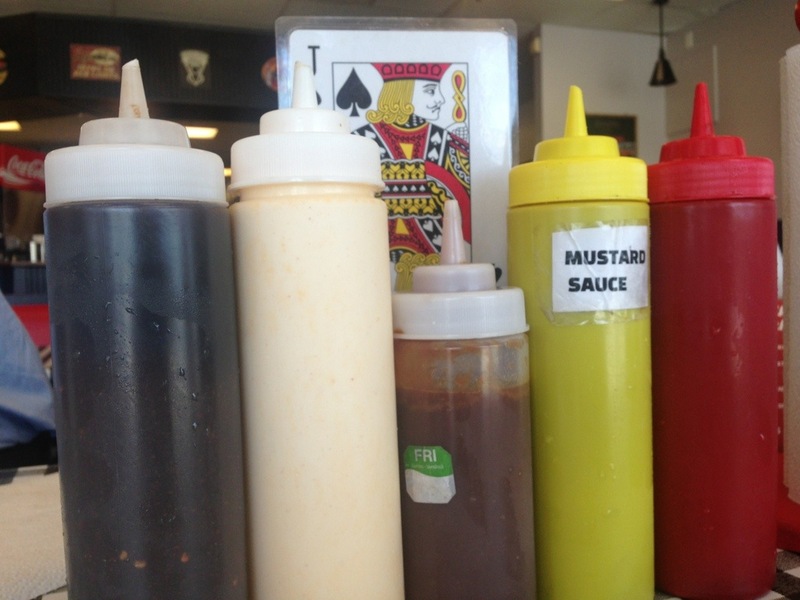 You can see the array of sauces pictured below, after we asked for the mayo sauce, which was kept in the fridge. All of the sauces were chilled, come to think about it. When you count the sauces, as I did, you can see that we’re one short. As our order was coming up, I went back and asked and the server said we were missing the “pit sauce” which is both hot (kept warm on the stove) and hot (with peppers). I sampled the sauces while we were waiting on our food. The sweet sauce was just that, very sweet. Made with peaches, I found it to be excellent on the turkey, (kind of like a barbecue thanksgiving). The vinegar based sauce, which they labeled spicy, was much more vinegary than spicy and extremely thin. The sweet and spicy was a mix of the first two, with the mix leaning heavily on the vinegar. 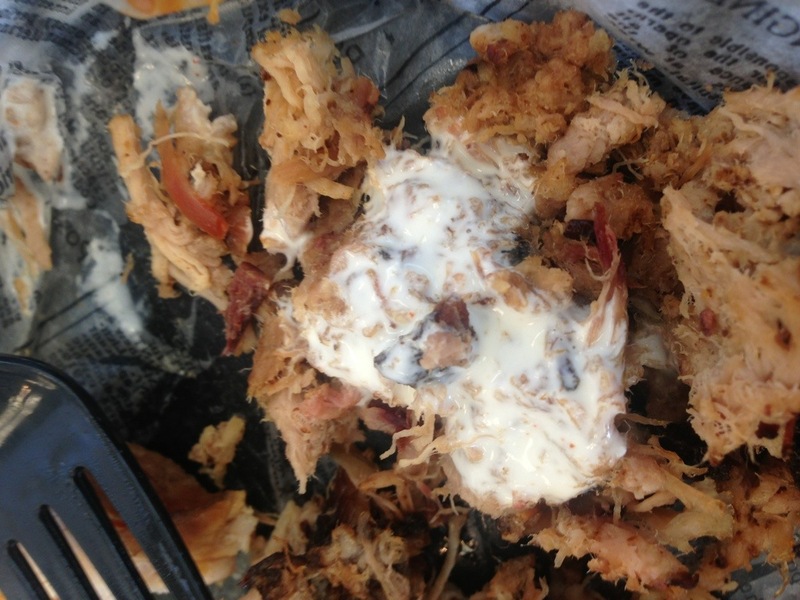 The mayo sauce was as delicious (as advertised) and I preferred it on the pork. I could imagine that with some Wonderbread, this would make for a terrific sandwich. The Carolina sauce was a little sweet (I guess it was the added honey) but I usually like it on the brisket, and this was no exception. But the “pit” sauce was the best, all around. Good on everything, thanks to the warmth and spices. 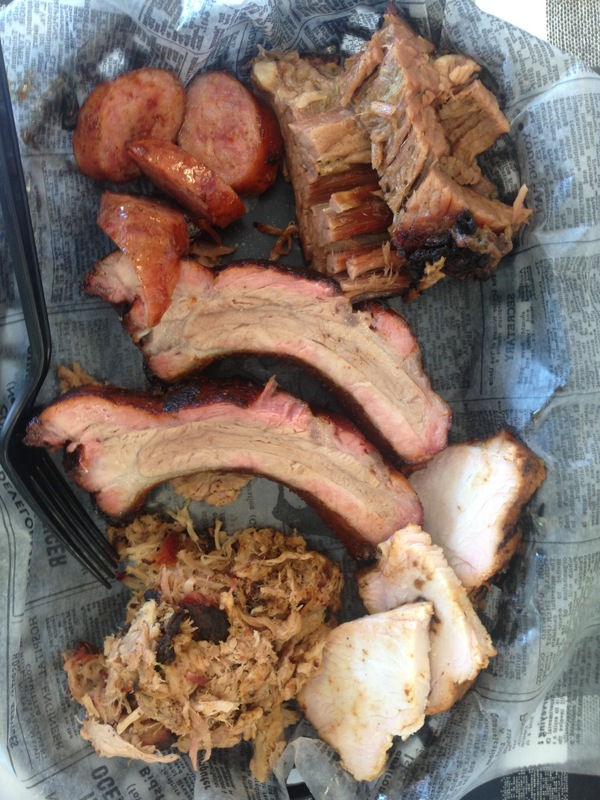 After perusing the choices, I decided on the 1/2 pound sampler (pork, beef, sausage and turkey) with two ribs. The Brunswick stew was extremely thick. It was full of pulled pork, corn and lima beans. This dispelled my theory that the best Brunswick stew is made from whatever is left in the kitchen tonight. There was neither corn or lima beans on the menu, so this was actually a recipe-based stew. The mac-n-cheese was also very thick, as if it was made with a bechamel sauce. 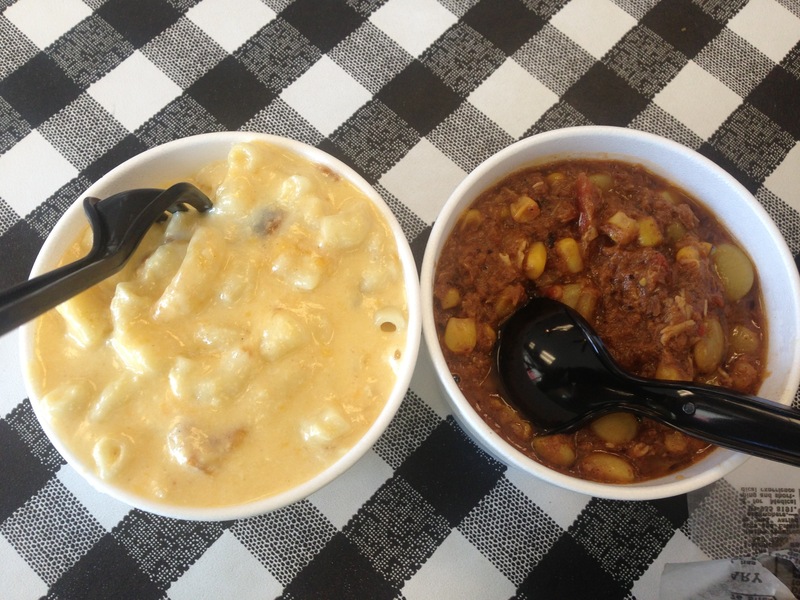 We were, according to our host, getting the first two servings of the mac-n-cheese for the day and it was piping hot, with a couple of pieces of the browned crust in the cup. 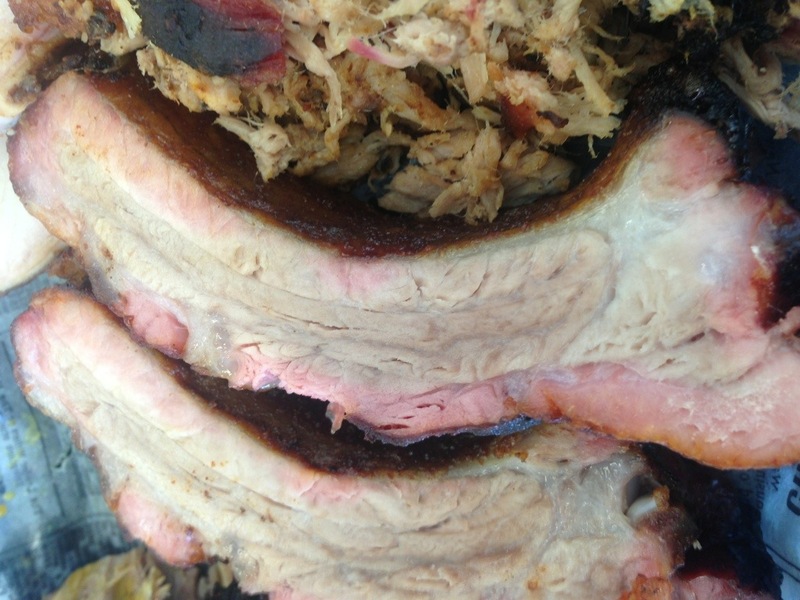 The ribs were a meaty cut with a 1/4″ smoke ring and taste to match. The turkey was borderline dry, but the taste was good, particularly when doused in that peach barbecue sauce. The brisket was excellent, sliced about an inch thick (it seemed much thicker than usual) and it flaked like roast beef and fell apart at the touch of a fork. And the sausage was exceptional, spicier and smokier than a good andouille. The pork was actually my least favorite of the five meats. It wasn’t bad (I liked it with the white sauce fairly well), but it wasn’t equal to the quality of the other four. In talking with the manager, I found that Steve (the owner) and his wife had never owned a restaurant before. Having been open for about seven months, it was sad to see the lack of people there. 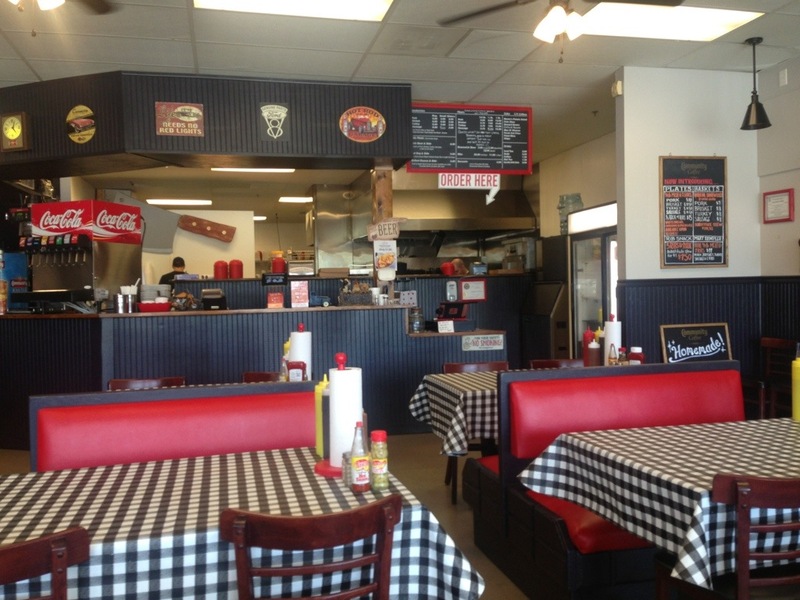 I hope that over time, the business builds because, overall, it’s mighty fine barbecue. I regretted not saving room for one of their homemade desserts, but now I have even more reason to return.